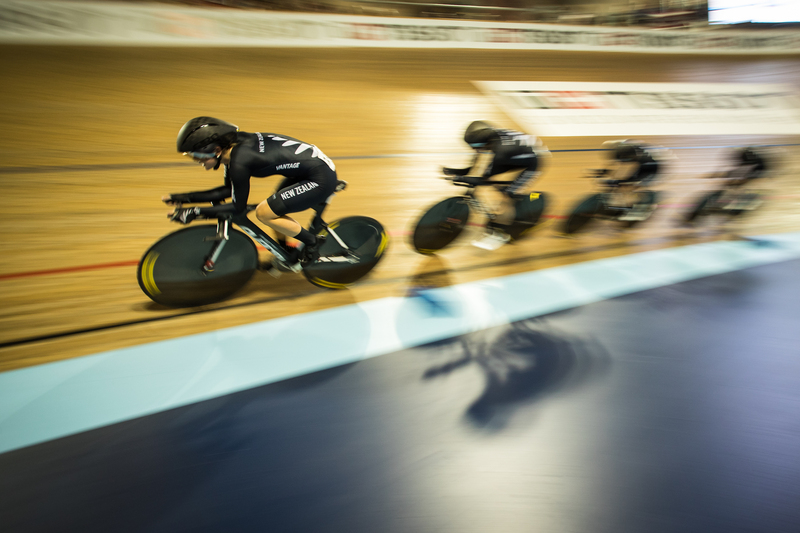 New Zealand aka “Team Black” sent their heavy hitters to compete including most of their Rio Olympics squad including Rushlee Buchanan Michaela Drummond Jaime Nielsen Racquel Sheath. 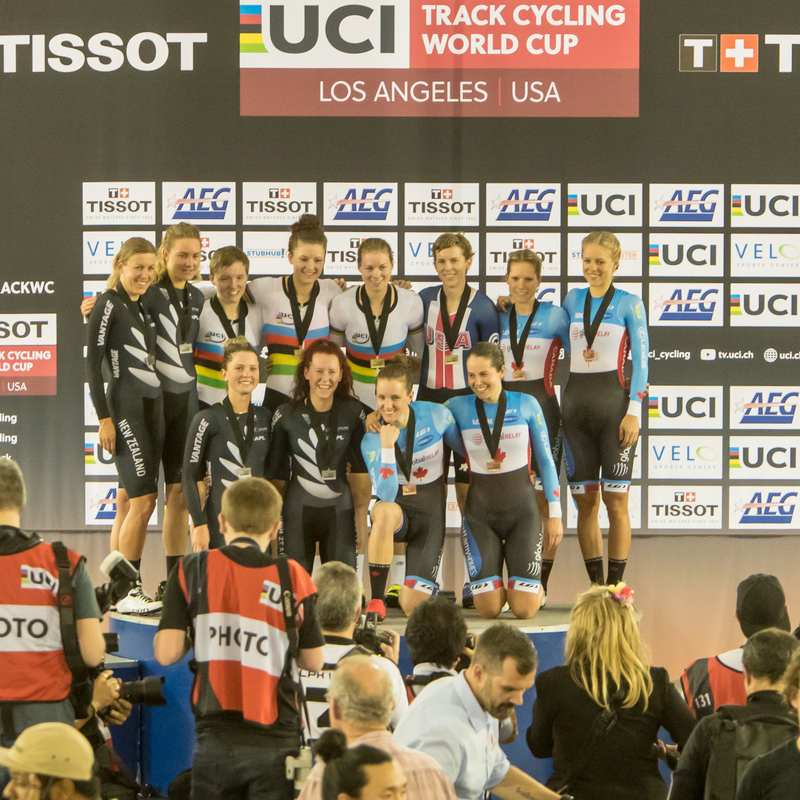 Ed note: This story was shared with us by Dennis Crane Photo who was at the UCI World Cup in LA. 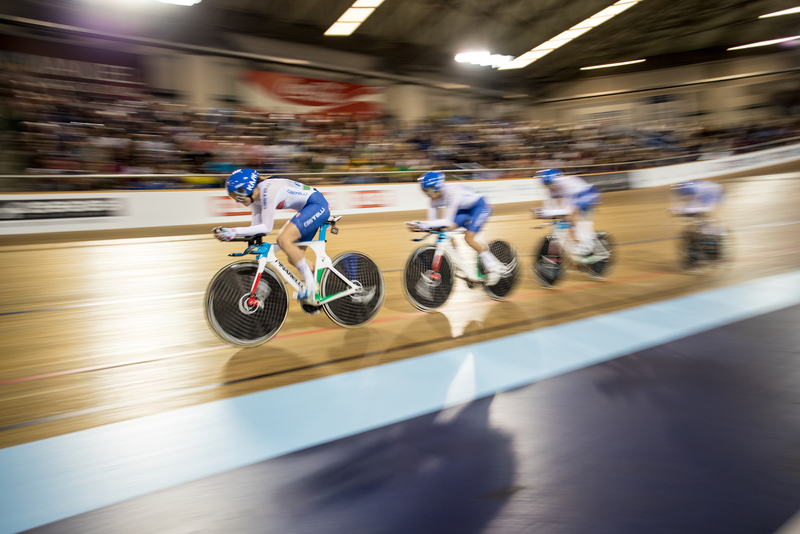 It has been 12 years since the ADT Event Center hosted the 2005 UCI World Championships of TrackvCycling. 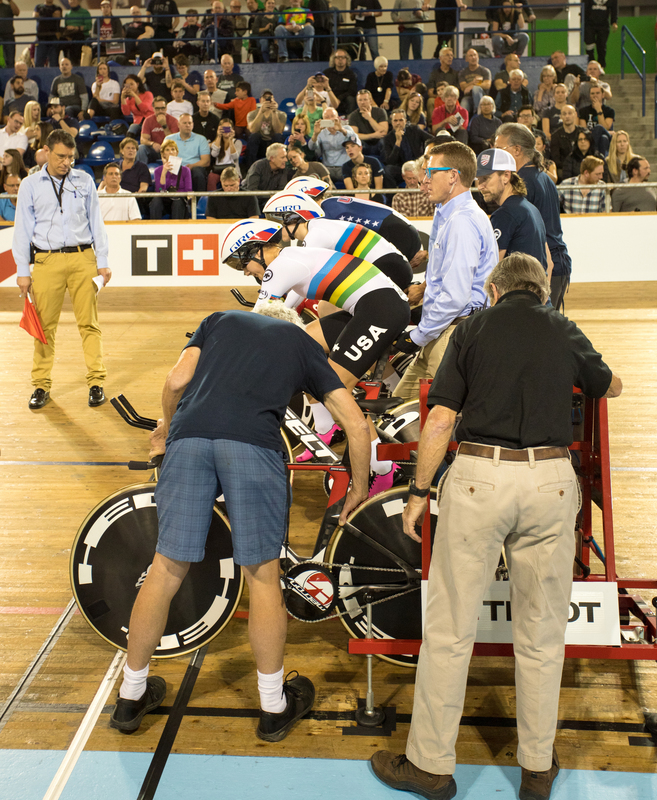 Since then many Junior and Masters National and World champivonships, UCI Track Cycling World Cups and the 2012 Para-Cycling World Championships competed on the Siberian pine of the only permanent indoor world standard 250-meter track in the United States. Team USA with three at the finish to win with a 4:19.9 clocking. 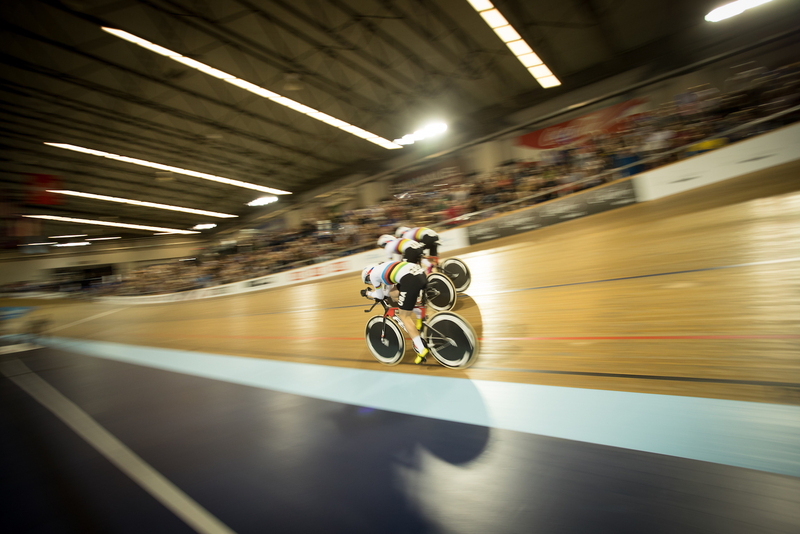 This past weekend the re-named VELO Sports Center hosted the 2017 UCI Track Cycling World Cup Los Angeles. With a lap to go the USA over take a dropped Kiwi coming out of turn 4. 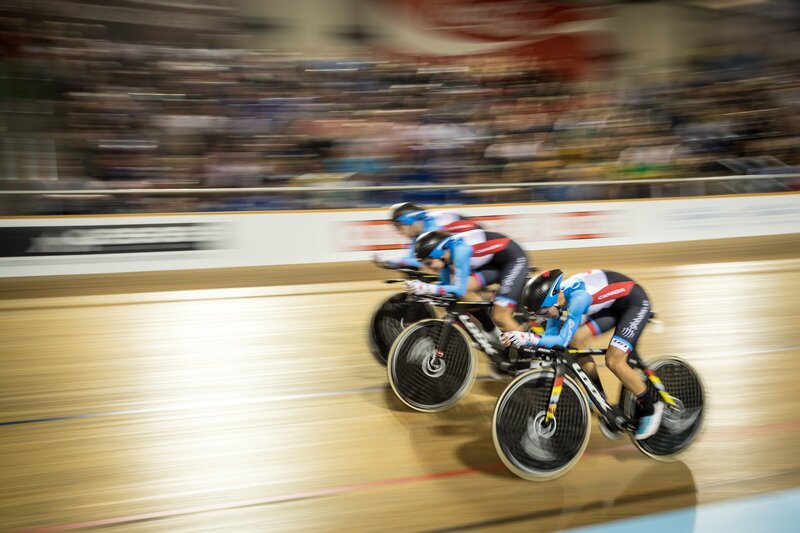 One of the premiere events of the weekend was the Women’s Team Pursuit. 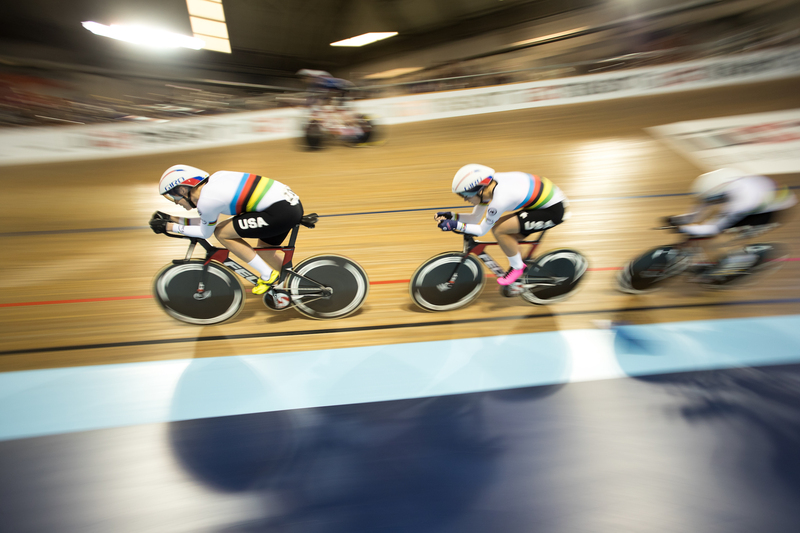 Team Pursuit is a race against the clock. Two four-rider teams start at opposite sides of the velodrome. 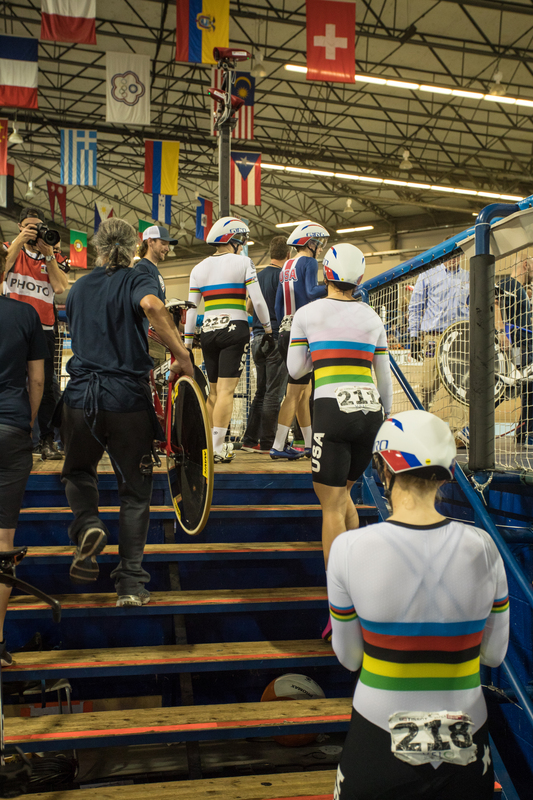 Leaving the staging zone to mount up and get ready to rocket, the World Champion stripes adorn the backs of USA’s Jen Valenti, Kelly Catlin & Chloe Dygert-Owen. Kim Geist at the top of the stairs proudly wears the USA Cycling kit. The riders follow their teammates in a tight single file formation, regularly switching the pace-making lead position to benefit from each other’s draft. The teams must finish the 4000-meter race with three of their four riders. When the third rider crosses the finish line, the clock stops. Canada on the way to a third place finish at the end of the pain tunnel. The current World Champion USA team was the clear favorite to stand on the top step of the podium but the New Zealand and Canadian team know what it feels like to be there too. The following images show the battle for the top three podium steps. The racers go full gas the entire race with accounts of how they see in tunnel vision as they push their physical limits. Total focus on the prize is part of the job description but the high speed leave everyth ing else a blur. he World Champions getting “locked and loaded” and ready to blast off. Enjoy the 2/25/17 battle between the US and New Zealand for the first and second place and the clash between Canada and Italy for third and fourth place.